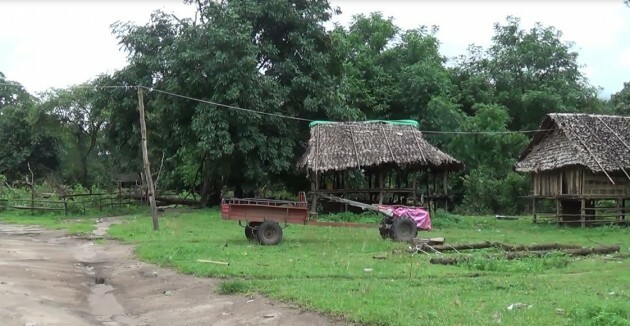 Fighting in early July 2015 between soldiers from the Democratic Karen Benevolent Army and government troops along the Asia Highway, not only forced villagers from their homes, but caused them to lose most of their household belongings and food supplies when fleeing the conflict. Control of the newly built Asia Highway that connects Myawaddy to Kawkreik caused conflict between the DKBA and the Burma Army. Civilians from six villages in Kawkareik Township were forced to abandon their homes and farms as they sought safety. Villagers explained to Karen News that it is always civilians who suffer the most during conflict. A villager from Kaung Mu village said that he and his neighbors live in constant fear of getting caught up in the fighting or being captured by the armies. Soldiers from the government’s militia, the Border Guard Force Battalion 1017, on September 9, arrested four villagers from Tandangu. Six villages were displaced by the fighting – Kaung Mu, Hlaing Sain, Saw Hae, Pyar Pin, Tadangu. The villagers claimed that because of the displacement they lost their household goods, animals and their land and farms were destroyed. The Kaung Mu villager said that the fighting had caused food shortages. During August, community groups, youth groups, private individual donors, including members of the BGF led by its Karen State’s secretary, General Saw Chit Thu, provided aid to the villages who lost their belongings during the fighting. General Saw Chit Thu Karen State BGF Secretary admitted that the fighting had caused massive problems for the villagers. General Saw Chit Thu acknowledged that the displacement of villagers was preventing them from attending their crops. Villagers who fled the intense fighting said they had little choice but to leave behind all their belongings – clothes, food supplies, shops, livestock, motorbikes and other farming tools. Villagers are now surviving on assistance provided by local Karen groups. A villager from Kaung Mu village said they urgently needed aid. Karen News understands that most of the villagers have returned to their villages, but they are worried for food and fear for their safety from unexploded ammunition, landmines and further fighting.